Put cherry juice and sugar in saucepan over medium heat and bring to a low boil. Once sugar is dissolved, remove from heat, and add the bloomed gelatin. Stir until gelatin is fully dissolved. Transfer liquid to a bowl and stir in cold rum. Put bowl in refrigerator. Put ¾ cup of cold water in a small bowl and sprinkle the 2 packets of gelatin on top of the water. Set bowl aside. Bring 1 cup water and cherry juice to a boil and remove from heat. Add bloomed gelatin, stir until fully dissolved. Transfer liquid to a bowl and stir in sweetened condensed milk and almond extract (if using). Put bowl in refrigerator. 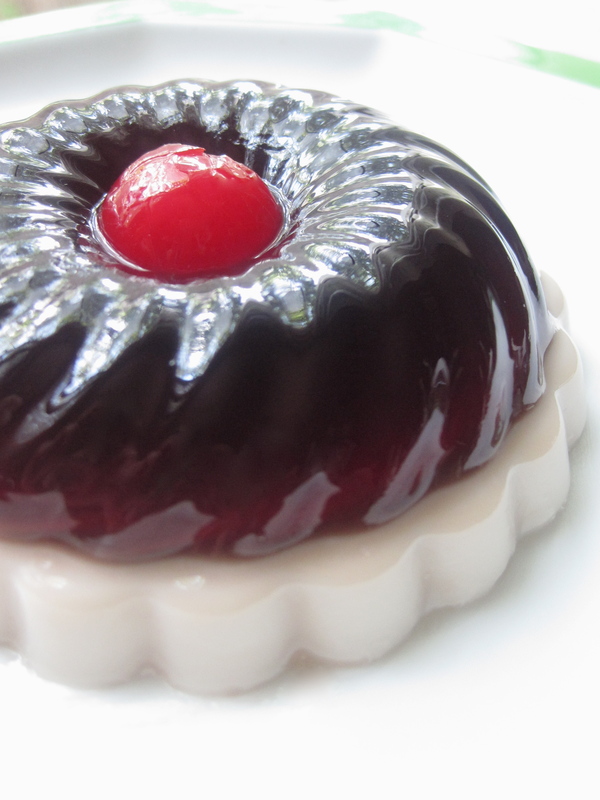 Once the cherry gelatin has thickened to a soft gel consistency (it should be easy to stir but thick enough to suspend the cherries), stir in cherries, and spoon mixture into mold(s). Put in refrigerator until almost set – some gelatin should stick to your fingers when lightly touched. 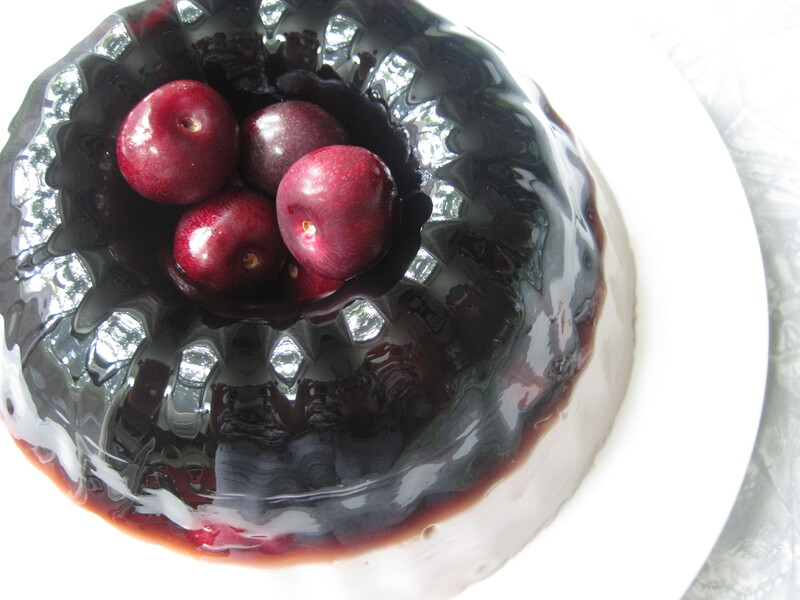 When the cherry layer is almost set, spoon the creamy layer into the mold(s). This looks absolutely decadent!! I am a bing cherry-fanatic as well and am also partial to rum! If it is possible to lust after food; this did it for me. I’ll dream of tasting this one till a hopeful meeting! This is definitely my favorite so far but as I say that I cringe because it is so hard to pick a favorite. The cherries and rum go so well together. The flavor combination is just delectable! I just found your website and this is soooo cool! I am from Mexico City, the World Capital of Gelatina! It is so underappreciated in the USA, I am so happy you are bringing it back – gourmet AND boozy! I’d love to interview you for Austin Woman or Austin Chronicle…may I? Thank you for your site, and recipes. So far all the ones I have tried have been a hit. I have made some omitting the alcohol and they too have been a hit with children. I really appreciate your sharing your recipes with us, and hope there will be many more to come. Thank you, Kate! I’m so glad you’ve enjoyed the recipes.